Roasted Broccoli is bursting with flavor, caramelized crispy tops and the quickest side dish to every meal all made in ONE PAN! AKA Minimal effort, HUGE flavor! Roasted Broccoli is about to become your new favorite vegetable – no more dreading eating your dinner greens or wondering what greens to make for a side! Once you learn how make to roasted broccoli (and I use the term “learn” loosely because roasting broccoli is soooo easy), you will never want to make broccoli any other way! There is a restaurant in Carlsbad called Campfire that boasts the most addicting oven roasted broccoli in. the. world. I never thought I would go to a restaurant just to order their broccoli! But I am not alone. Their Roasted Broccoli is actually Chef Andrew Bachelier’s top-selling menu item. Who knew Roasted Broccoli could be so crazy delicious?! Their edges are extra charred and extra crispilicious. The secret is to oven roast the broccoli and then flash-fry the broccoli head in fish oil! It’s then served with tantalizing North African Chermoula Sauce and candied peanuts. So if you are ever in Carlsbad, Campfire’s Roasted Broccoli is a must! But I digress. As I drool a little. My point is Roasted Broccoli can actually be crave-worthy. Shockingly delicious even. Broccoli get’s a bad rap because when steamed or oven roasted at a low temperature for too long, the sulfurous compounds have time to develop resulting in unappetizing sulfur smell. But when you roast broccoli at HIGH heat, the broccoli cooks quickly and the piping hot surface area of the pan caramelizes the natural sugars for a wonderfully nutty flavor and wonderfully crunchy tops. Aside from the delish factor, Roasted Broccoli is one of my favorite sides along with Roasted Cauliflower and Roasted Asparagus, because it’s uber healthy, one of the quickest side dishes to prepare, goes with practically every meal and is all made in ONE PAN! 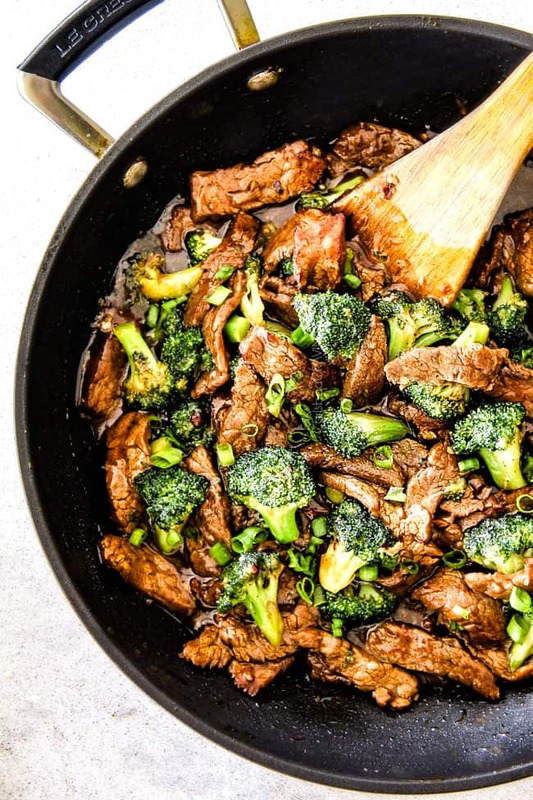 So if you have energy to toss a few pantry staple ingredients with broccoli and spread them on a pan, you can always have a delicious side to every meal! 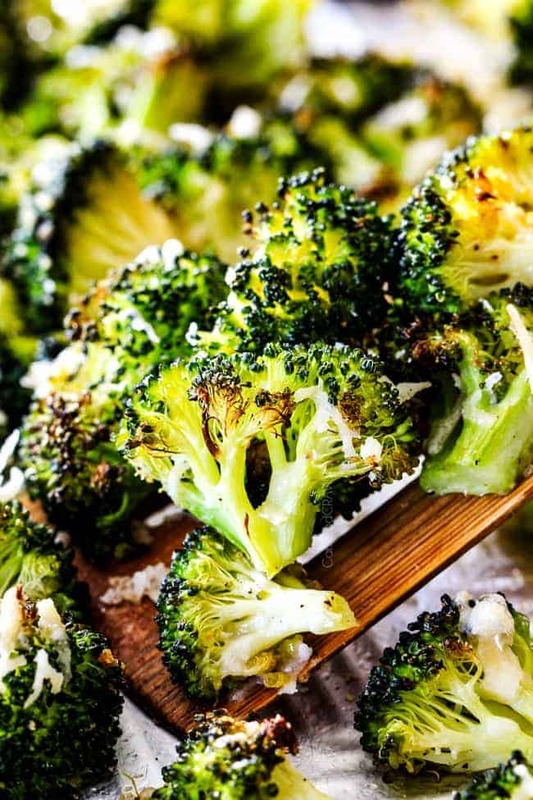 Roasted Broccoli is virtually a blank canvas to create a side delicious enough for company but everyday easy from Garlic Roasted Broccoli to Garlic Lemon Roasted Broccoli to Parmesan Roasted Broccoli and even Cheddar Broccoli! For this Roasted Broccoli recipe, I’ve paired it with Parmesan but feel free to be as creative or simple as your taste buds desire! How do I Choose Broccoli? feels heavy for its size. is fresh, moist looking stalk ends. How Do I Store Broccoli? Store broccoli in a well ventilated plastic bag in the crisper drawer of your refrigerator. To do this, place broccoli in freezer bag and seal. Poke numerous holes in the bag near the broccoli’s head. The holes in the bag will ensure proper air circulation. Never wash broccoli before storing or seal completely. If broccoli is bought fresh and stored properly, it can last up to 10 days. What ingredients do I need for ROASTED Broccoli? Broccoli is a blank canvas for whatever seasonings suite your cuisine or you are in the mood for. Below are the basic ingredients for Roasted Broccoli but feel free to get as creative as you would like! Broccoli florets: try and trim to a uniform size. Olive oil: use extra virgin olive oil for more flavor. Salt: salt is a MUST otherwise your roasted broccoli will taste bland. 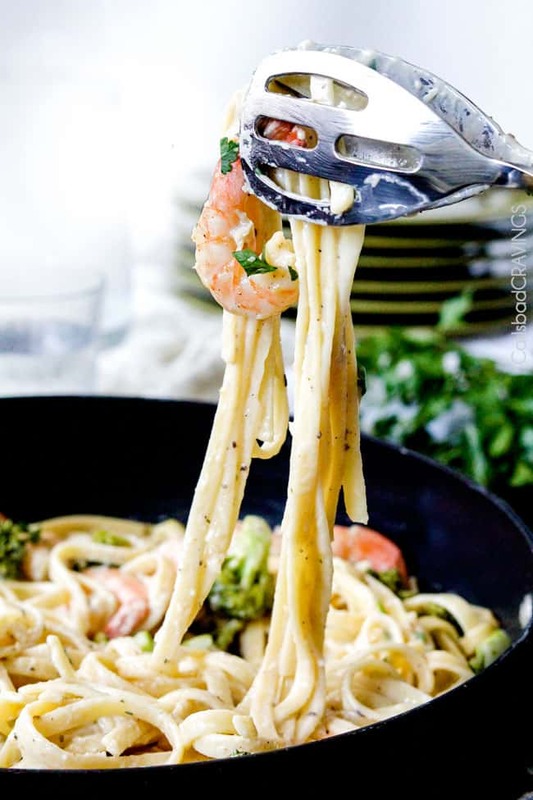 Garlic: you can either use 1/2 teaspoon garlic powder or 2 cloves minced garlic – both work but I prefer garlic powder as it tends to distribute more evenly. Onion powder: this is optional but I love the subtle depth of flavor it adds. I highly recommend freshly grated Parmesan as opposed to the powdery stuff. Freshly grated Parmesan tastes far superior and melts much better. Lemon juice and/or zest also pairs beautifully with Roasted Parmesan Broccoli. As in all recipes, please remember you can customize the measurements to suit your tastes/mood. You can add more or less garlic, lemon juice, lemon zest and/or Parmesan and any other seasonings. The possibilities are endless for this one pan tender-crispy Roasted Broccoli! How long does it take to roast broccoli? Roast Broccoli at 500 degrees F for 15-18 minutes or until the tops of the broccoli are charred. We use an extremely HIGH temperature to caramelize the broccoli. What is the Best way to ROAST BROCCOLI? Meanwhile, line a baking sheet with foil and spray with cooking spray. Add florets to prepared pan and drizzle with olive oil, salt, pepper and garlic/garlic powder. Toss until evenly coated. Line in a single layer. Roast for 15-18 minutes OR until broccoli reaches desired crisp-tenderness. Roast for 12-15 minutes then sprinkle with Parmesan. Broil until Parmesan is melted, approximately 3-5 minutes. Continue to broil if desired for crispier or more charred florets. Season with additional salt and pepper to taste if desired. Cut Broccoli into uniform size florets. Uniform pieces ensures the broccoli will cook evenly. We want fairly small florets, about 1 1/2 – 2”. This creates more surface area for caramelization and especially for the charred ends – my fav! The smaller the broccoli the faster it will cook, so keep that in mind when oven roasting your broccoli. Bake at a high temperature. We roast our broccoli at 500 degrees F. The extremely high heat cooks the broccoli will caramelizing the outside. Use foil for easy cleanup. 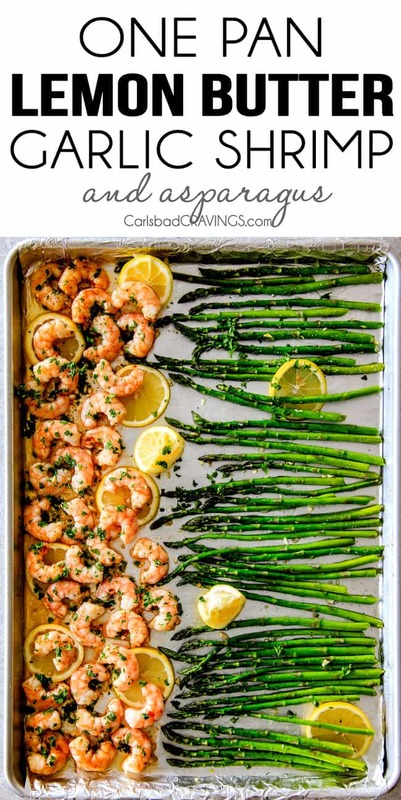 by lining our baking sheet with foil, you virtually have NO dishes to wash. Foil also promotes the caramelization process. Do NOT use parchment paper and expect the same results. Dry broccoli very well. Dry your broccoli extremely well using (paper) towels and/or a salad spinner. The dryer your broccoli the crispier it will become! Don’t overcrowd pan. Line your broccoli an even layer so it will cook evenly and so it will roast instead of steam. If is better to use two pans than to overcrowd your pan. To flip or not to flip your broccoli: Flipping your broccoli half way through roasting is optional and I often don’t bother with this step. If you flip your broccoli half way it promotes more even cooking but if you don’t flip then one side gets extra crispy and that is how I like it. Roast until crisp: If you want crispier edges, just roast on! For less charred edges, remove broccoli from the oven soon as they are tender but the edges haven’t started to brown yet. Can I Roast Frozen Broccoli? Yes and no. Yes, you can roast frozen broccoli but no it will not turn out the same. Frozen broccoli contains more water and therefore it will not get nearly as crispy when roasted. It will still be flavorful, but don’t expect the same texture. Can I Make Roasted Broccoli Ahead of Time? 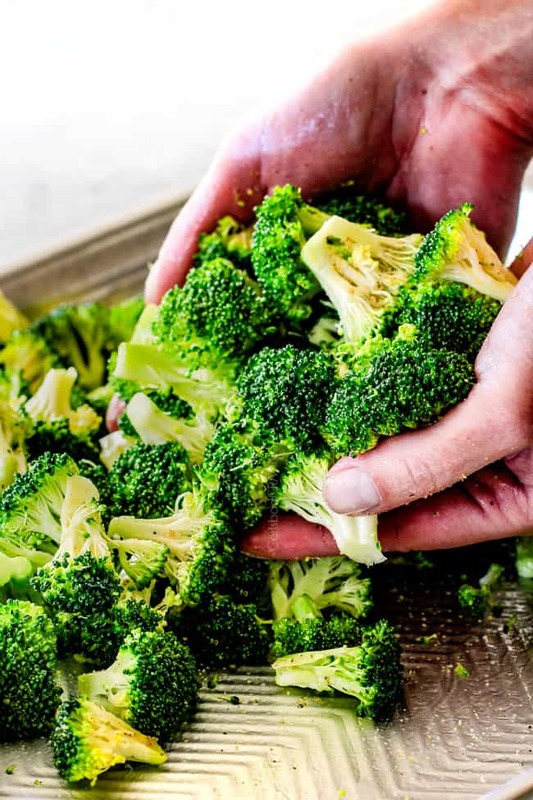 If you want to prepare your broccoli in advance, then I suggest tossing the broccoli with the olive oil, seasonings and spreading it out on the baking sheet and then refrigerating. When you are ready to eat then oven roast your broccoli. What Should I do with Roasted Broccoli Leftovers? I love my roasted broccoli leftovers! They are fabulous plain or added to pastas, rice, omelettes and even pizza! How long does Roasted Broccoli Last? Roasted Broccoli can be stored in an airtight container and refrigerated for up to 4 days. How Do I reheat Roasted Broccoli? You can reheat Roasted Broccoli in the microwave or on the stove top but for crispier broccoli, heat it in the oven at 350 degrees F until hot. Broccoli is a superfood packed with fiber, vitamins and minerals and is considered to the most nutritious vegetable! Although impressive, the health benefits are just a bonus to this highly addictive snack. 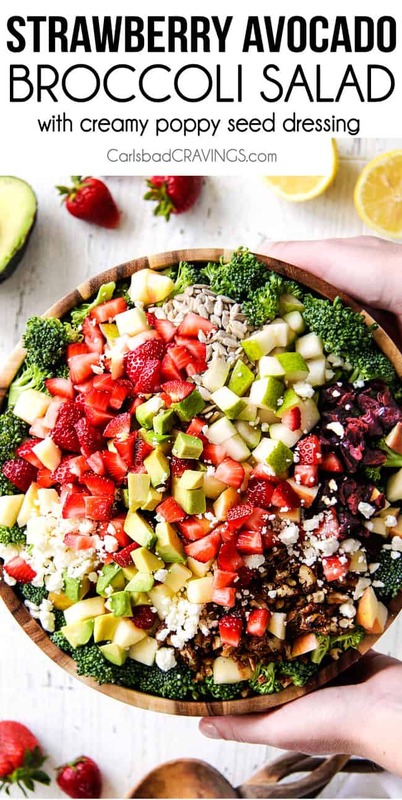 Broccoli is proven to aid in cancer, heart disease and diabetes prevention, cholesterol reduction, boost immunity, reduce inflammation, promote healthy digestion, remove toxins and so much more! Looking for more Oven Roasted Vegetable Recipes? 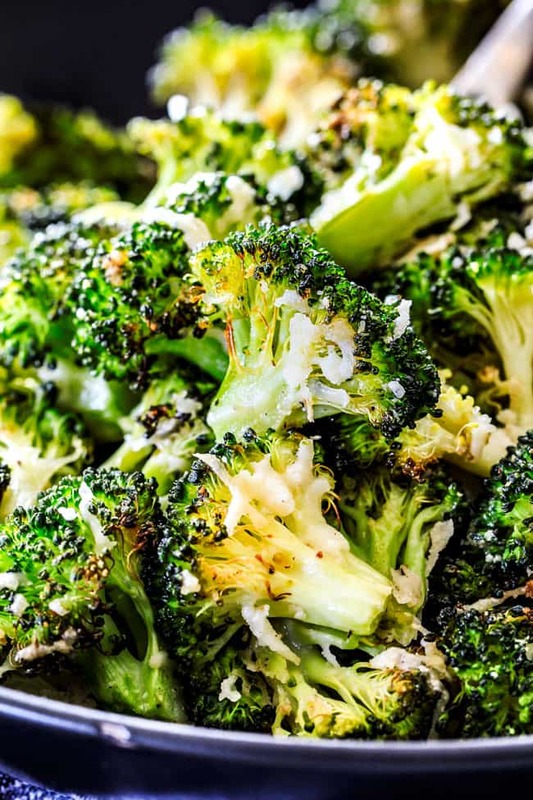 Want to try this Roasted Broccoli with Parmesan? Pin it to your SIDES or VEGETABLE to SAVE for later! Roasted Broccoli is bursting with flavor, caramelized crispy tops and the quickest side dish to every meal all made in ONE PAN! AKA Minimal effort, HUGE flavor! 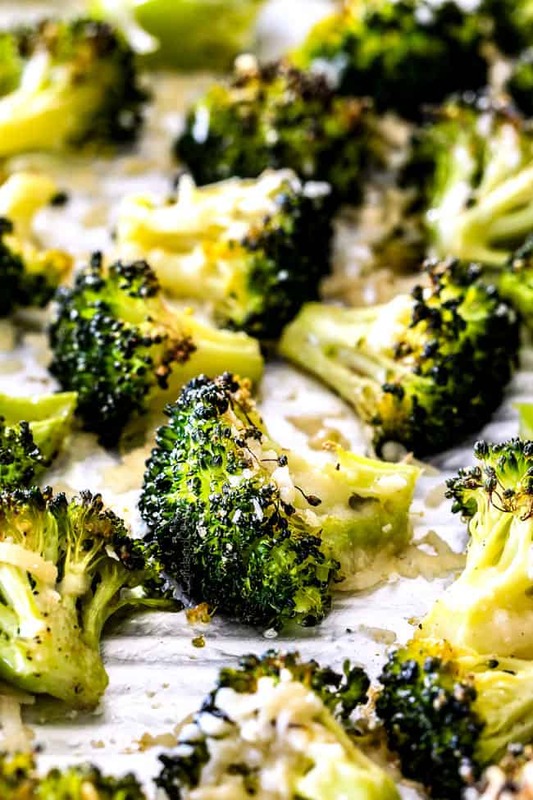 Roasted Broccoli is virtually a blank canvas to create a side delicious enough for company but everyday easy from Garlic Roasted Broccoli to Garlic Lemon Roasted Broccoli to Parmesan Roasted Broccoli and even Cheddar Broccoli! For this Roasted Broccoli recipe, I've paired it with Parmesan but feel free to be as creative or simple as your taste buds desire! Dry your broccoli extremely well using paper towels or a salad spinner. The dryer the broccoli the crispier it will get! Trim florets to a uniform size then add to prepared pan and drizzle with olive oil, salt, pepper and garlic/garlic powder. Toss until evenly coated. Line in a single layer. Roast for 12-15 minutes if adding Parmesan or 15-18 if not adding Parmesan (because the broccoli will go back in the oven) OR until broccoli reaches desired crisp-tenderness. Sprinkle with Parmesan. Broil until Parmesan is melted, approximately 3-5 minutes. Continue to broil if desired for crispier or more charred florets. Season with additional salt and pepper to taste if desired. Will this recipe work with cauliflower as well? How about both at the same time? Great question! Yes, you can cook them both at the same time! That is awesome when even a picky eater will eat broccoli! YAY! thanks Chaundra!